To gain an understanding of graphical methods used to determine rate laws. To gain an understanding of half-life with respect to first-order reactions. An alternate way to determine a rate law is to monitor the concentration of reactants or products in a single trial over a period of time and compare that to what is expected mathematically for a first-, second-, or zero-order reaction. where “ln” is the natural logarithm, [A]0 is the initial concentration of A, and [A]t is the concentration of A at another time. The process of integration is beyond the scope of this textbook, but is covered in most calculus textbooks and courses. The most useful aspect of the integrated rate law is that it can be rearranged to have the general form of a straight line (y = mx + b). 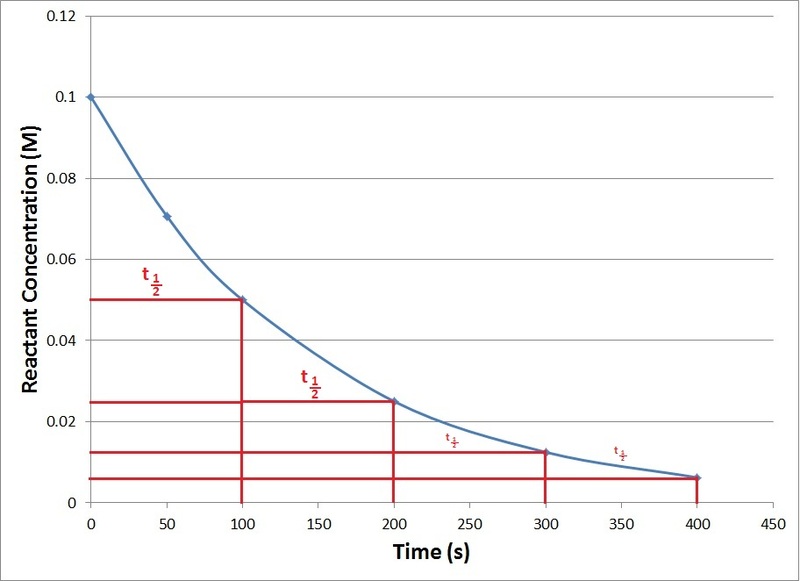 Therefore, if we were to graph the natural logarithm of the concentration of a reactant (ln) versus time, a reaction that has a first-order rate law will yield a straight line, while a reaction with any other order will not yield a straight line (Figure 17.7 “Concentration vs. Time, First-Order Reaction”). 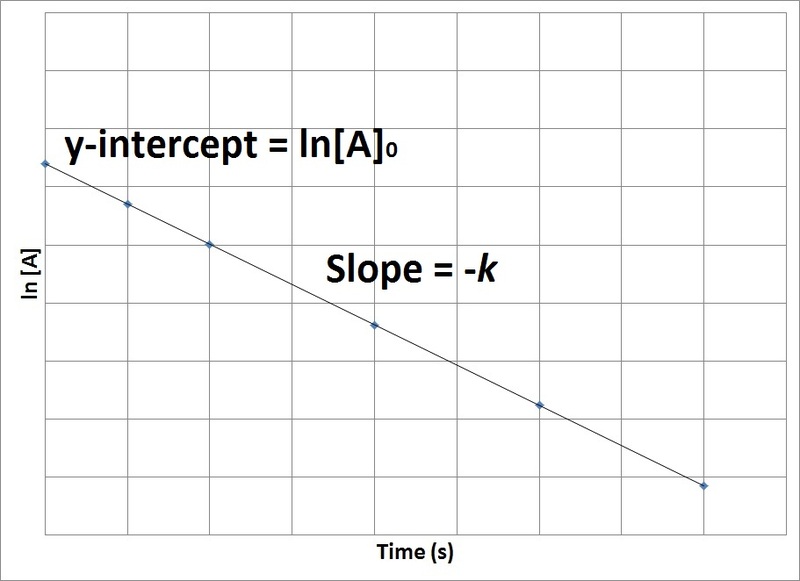 The slope of the straight line corresponds to the negative rate constant, –k, and the y-intercept corresponds to the natural logarithm of the initial concentration. This graph shows the plot of the natural logarithm of concentration versus time for a first-order reaction. The decomposition of a pollutant in water at 15oC occurs with a rate constant of 2.39 y-1, following first-order kinetics. If a local factory spills 6,500 moles of this pollutant into a lake with a volume of 2,500 L, what will the concentration of pollutant be after two years, assuming the lake temperature remains constant at 15oC? We are given the rate constant and time and can determine an initial concentration from the number of moles and volume given. 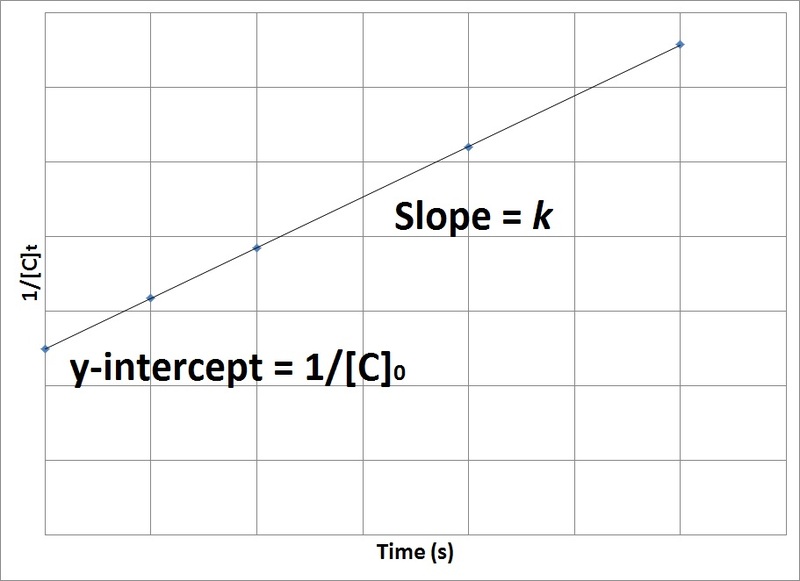 Therefore, if the reaction is second order, a plot of 1/[C]t versus t will produce a straight line with a slope that corresponds to the rate constant, k, and a y-intercept that corresponds to the inverse of the initial concentration, 1/[C]0 (Figure 17.8. “1/[C]t vs. Time, Second-Order Reaction”). The graph shows a plot of 1/[C]t versus time for a second-order reaction. 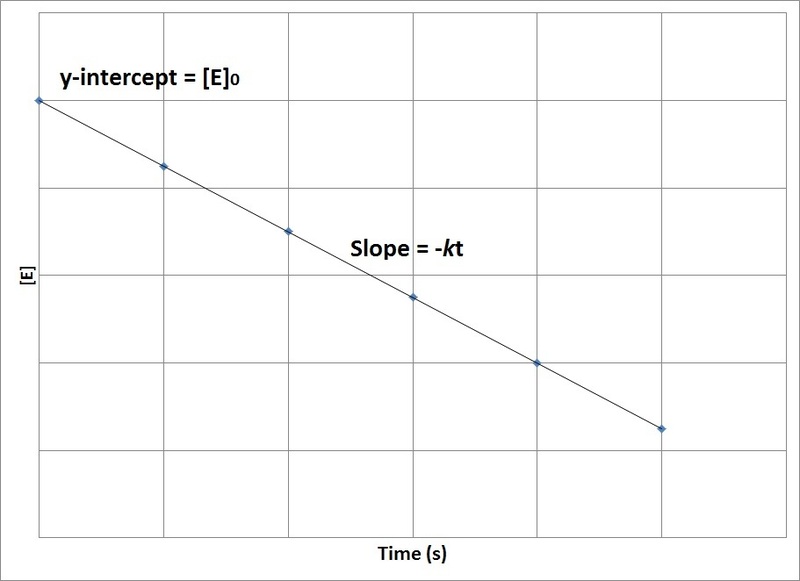 Therefore, if the reaction is zero order, a plot of [E] versus t will produce a straight line with a slope that corresponds to the negative of the product of the rate constant and time, –kt, and a y-intercept that corresponds to the initial concentration, [E]0 (Figure 17.9. “Concentration vs. Time, Zero-Order Reaction”). The graph shows the plot of concentration versus time for a zero-order reaction. We have just seen that first-, second-, and zero-order reactions all have unique, integrated rate-law equations that allow us to plot them as a straight line (y = mx + b) (Table 17.1 “Integrated Rate Law Summary”). When presented with experimental concentration–time data, we can determine the order by simply plotting the data in different ways to obtain a straight line. Determine the order of the reaction. We can plot the characteristic kinetic plots of zero-, first-, and second-order reactions to determine which will give a straight line. The reaction is second order since 1/[A]t versus t gives a straight line. The half-life of a reaction, t1/2, is the duration of time required for the concentration of a reactant to drop to one-half of its initial concentration. Half-life is typically used to describe first-order reactions and serves as a metric to discuss the relative speeds of reactions. A slower reaction will have a longer half-life, while a faster reaction will have a shorter half-life. Since the half-life equation of a first-order reaction does not include a reactant concentration term, it does not rely on the concentration of reactant present. In other words, a half-life is independent of concentration and remains constant throughout the duration of the reaction. Consequently, plots of kinetic data for first-order reactions exhibit a series of regularly spaced t1/2 intervals (Figure 17.10 “Generic First-Order Reaction Kinetics Plot”). This graph shows repeating half-lives on a kinetics plot of a generic first-order reaction. A reaction having a first-order rate has a rate constant of 4.00 x 10-3 s-1. 2. How long will it take for a sample of reactant at 1.0 M to decrease to 0.25 M? 3. What concentration of the 1.0 M sample of reactant would you expect to be present after it has reacted for 500 s? 2. A simple way to calculate this is to determine how many half-lives it will take to go from 1.00 M to 0.250 M and use the half-life calculated in part 1. Therefore, it will take 2 x 173 s = 346 s.
3. We can use the rate-constant value in the integrated rate law to determine the concentration remaining. The reaction rate may be determined by monitoring the concentration of reactants or products in a single trial over a period of time and comparing it to what is expected mathematically for a first-, second-, or zero-order reaction. The half-life of a reaction is the duration of time required for the concentration of a reactant to drop to one-half of its initial concentration. Concentration–Time Relationships: Integrated Rate Laws by Jessie A. Key is licensed under a Creative Commons Attribution 4.0 International License, except where otherwise noted.